Global Finance: Can you explain how the Central Bank of Turkey’s monetary policy with respect to credit and price stability has changed following the 2008 global financial crisis? Dr. Turalay Kenç, deputy governor, Central Bank of Turkey: The Turkish economy rebounded quickly from the global financial crisis, recording between 8% and 9% annual growth during the years 2010 to 2011. But these high growth rates raised financial stability concerns as the current-account deficit increased to 10% of GDP. As a result, the Central Bank of Turkey opted for a different kind of monetary policy, which had, basically, two objectives. One was price stability and the other objective was financial stability—to address the challenges posed by volatile capital flows, which were an issue for us in the post-global-financial-crisis era. Since then we’ve used several macroprudential measures and targeted the credit growth rate, which was quite high during those years—around 35%. The policies undertaken initially brought the credit growth rate down to 25%, and now it’s 15%. In the meantime, Turkey formed the Financial Stability Committee, which is charged with the responsibility of taking decisions on macroprudential measures. Within this setup the use of macroprudential measures or monetary policy very much depends on volatility in the exchange rate market. Since the beginning of May 2013, when the US Federal Reserve started to talk about the tapering of large-scale asset purchases, the Turkish lira has, more or less, been depreciating. Therefore, we have maintained a tight monetary policy stance since then. The macroprudential policy stance has tightened, too. The Federal Reserve tapering has been quite interesting for the appropriate monetary policies in emerging market economies. Initially, we implemented a monetary policy in order to reduce the volatility coming from global financial markets into local markets. The policy was quite successful in doing that from May 2013 until December 2013. But in December 2013, domestic political developments led to further uncertainty in the Turkish financial markets, generating significant pressures on the currency. We acted quite strongly by raising interest rates significantly. Since then, financial conditions, both at home and globally, have improved, and as a result of that we’ve cut the policy rate. But because of strong exchange rate pass-through effects, we have a price stability issue on our hands. We will therefore maintain the current tight monetary policy stance until there is a significant improvement in the inflation outlook. Selim Çakir, chief economist, Türk Ekonomi Bankasi: What is worrying the markets is that we are having close to double-digit inflation when global commodity prices are relatively moderate and domestic demand is more or less stagnant. It’s not only headline inflation that is close to double digits but also several subcomponents of inflation, such as service prices. But inflation is not the central bank’s only problem. More needs to be done by other actors. Maybe Turkish society as a whole needs to acknowledge that we really should move toward a rate of inflation of 5% for the country. But the consensus doesn’t seem to be there. Serkan Özcan, assistant general manager and head of economic research and strategy, Odeabank: Since 2010 we have seen a change in rhetoric from the Central Bank of Turkey. Targeting financial stability with price stability is a major change, and actually it’s the end of the transition from the strong economy program to a sustainable growth program. We don’t want high growth rates, which are not supported by high external demand, or at least, positive external demand. So after 2010, our main target was not government or private consumption but rather balancing internal demand with external demand so that we can grow and don’t have a current-account deficit, which may be harmful not only to the overall growth model of Turkey but also to the financial system as a whole. For me, getting an investment-grade rating by at least two of the big rating agencies is very much related to what the central bank achieved by putting financial stability in their monetary policy framework. Ayşe Meltem Ağci, general manager, Oyak Yatırım Menkul Değerler: One of the most important problems of the Turkish economy is productivity and the lack of sufficient savings. Why can’t we increase the size of the capital markets? Because we don’t have enough savings. And on the productivity side, we have grown a lot in the last five years, around 7%. But from which sectors did we have this growth? As the latest discussions are about whether to boost the industry sector versus the construction sector, that’s really a very important question, because that’s the core problem of our current-account deficit. We have a deficit and we have exports, but how much of our imports are we using to produce our exports? On the savings side, Turkey is looking to establish Istanbul as a financial center. But the number of equity owners in Turkey has not increased at all since 1980. Pension funds are the only funds that are increasing in size and in the number of participants in Turkey. We have to attract more domestic investors into the system to boost the financial markets. GF: The other issue going forward is that quantitative easing had a tough impact on markets like Turkey. How has that affected monetary policy? Kenç: The current-account deficit has two components—the structural component, which is very important, and the cyclical component. On the structural component there has been a range of structural reforms. Most of them were drafted in Turkey’s 10th five-year development plan. One of the key reforms was an objective to bring the domestic savings rate from its current rate of 14% to 19%. With that sort of savings rate the Turkish economy will be in a better structural position, and the current-account deficit will be lower. Coming to the cyclical component of the deficit, with advanced economies reaching the peak of the financial cycle, Turkey is at a different position in the cycle. Therefore, Turkey has to rebalance domestic and external demand. For example, European economies have not grown much in the last five to six years, which didn’t help Turkish exports. That weakness in Europe contributes cyclically to Turkey’s current-account deficit. The Central Bank of Turkey had to act and deal with the cyclical problem stemming from the unbalanced aggregate demand in the Turkish economy—weak external demand and strong domestic demand. But at the same time the central banks of advanced economies, including the Federal Reserve, the Bank of England, Bank of Japan and the European Central Bank, have pursued unconventional monetary policies, which in turn led to substantial increases in global liquidity. 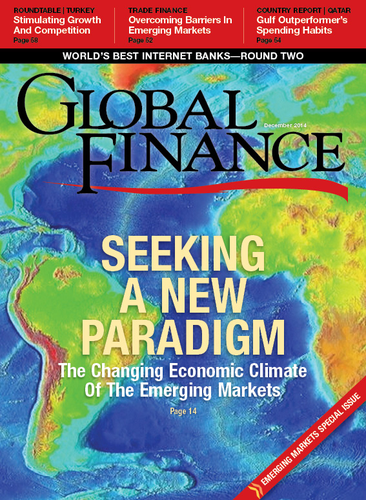 This has created easy borrowing conditions for emerging market economies in global financial markets, which, in turn, led to increased domestic borrowing and domestic demand. Now, the latest move is going to be easing by the European Central Bank, so we may see the impact of that on emerging market economies. It should be expected that it may lead to borrowing in European financial markets, because there will be lower interest rates together with a depreciating euro, which is attractive for borrowers..
Çakir: Even if we correct the deficit and take it, for instance, from last year’s 8%, it’s very difficult to bring it back to normal. Today maybe the dilemma that we are facing is that Turkey still has a high current-account deficit despite a slow growth rate. The current-account deficit may come as low as 5% of GDP this year, but it may be slightly higher than that if we grow next year as well. Of course, we don’t know what will happen with oil prices. We’ve been defensive for the last couple of years. We didn’t push our growth rate excessively high, but still we will be caught with a relatively high external financing need. Now if the ECB and the Bank of Japan continue with their quantitative easing policies, then that would possibly mitigate the impact of a US Federal Reserve rate hike cycle on emerging market countries. But the US dollar is still the dominant currency, so it will be the dominant factor. Looking at the next couple of years, the external financing environment could be a bit more binding for Turkey, so we may—even if we wanted to stimulate our domestic demand with looser policies— not be able to do so. Özcan: What we saw in 2010 to 2011 was a very high current-account deficit. But at the same time we knew that with the high levels of global liquidity and very loose monetary policy, our buffer for the deficit was very high. Today it is not sustainable to have an 8%, 9%, or 10% current-account deficit. That’s why putting financial stability in the monetary policy framework is important. In the second quarter of this year, Turkey’s saving ratio reached 14%. That helps, and if you compare last year’s January-to-July period with this year’s, the deficit dropped by 38%. Five percent [of GDP] is a good number for the deficit. If we can reach that, the global economy and all liquidity conditions will still be supportive for Turkey. GF: Are there voices calling for a less-tight monetary policy stance in light of what’s happening on the growth side? Kenç: On the growth side, prospects have been quite positive in the last five quarters, except for the last quarter where the GDP growth rate dropped to 2.1%. But if you look at the leading indicators, there are positive signs on the growth side again in the coming quarters. So overall, while Turkey may not achieve a 4% growth rate at the end of this year, it will be somewhere in between 3% to 4%, which is quite reasonable. Turkey needs balanced growth because of some flow balance problems the economy has in the area of price stability and the current-account deficit. Ağci: There is some debate about the middle-income trap in Turkey at the moment. The government is taking some steps to boost growth, but of course, exports have had great shocks lately from the political risks around the world, and our export partners are at war. Therefore, the expectation that growth will be a bit less than it was in the last few years is not unusual. There will be a balance between interest rates and growth rates, and it won’t hurt the economy too much in the coming six months. Çakir: Turkey is not used to having a sustained period of low growth. We used to have our recessions, quick recovery in a quarter or two, and then strong growth rates. As we enter into next year, it could be a bit more challenging in a US Fed rate- hike cycle to sustain growth of 4% or more. If we don’t see a growth level that is acceptable, then the discussion on interest rates will come to the forefront, and of course there are certain circles that believe that by lowering rates or that by a more depreciated exchange rate, we will solve Turkey’s problems. However, it is not that easy. There’s a limit as to how much we can stimulate economic activity through exchange rate depreciation. Özcan: As compared to the last five years, we will have a normalization in the world. So one should not be expecting the same amount of growth, not only for Turkey, but for most of the emerging market countries. It’s not only the interest rates or short-term currency movements which can rebalance and contribute to growth. From my point of view, as a banker, we all know that effective rates or monetary policy rates for Turkish banks or the Turkish banking system are much higher than 8% to 9% right now. As a result of banking regulation, we are carrying 400 basis points more capital than any banking system in the world. So we cannot just say that interest rates are low or high just by looking at the monetary policy stance. Turkey is applying tight monetary policy by using short-term interest rates plus macroprudential tools. So we have room, I believe, other than in the area of interest rates, to grow more. But again, the problem is how to rebalance.